Discussion in 'Announcements' started by Daniel, Sep 13, 2013. 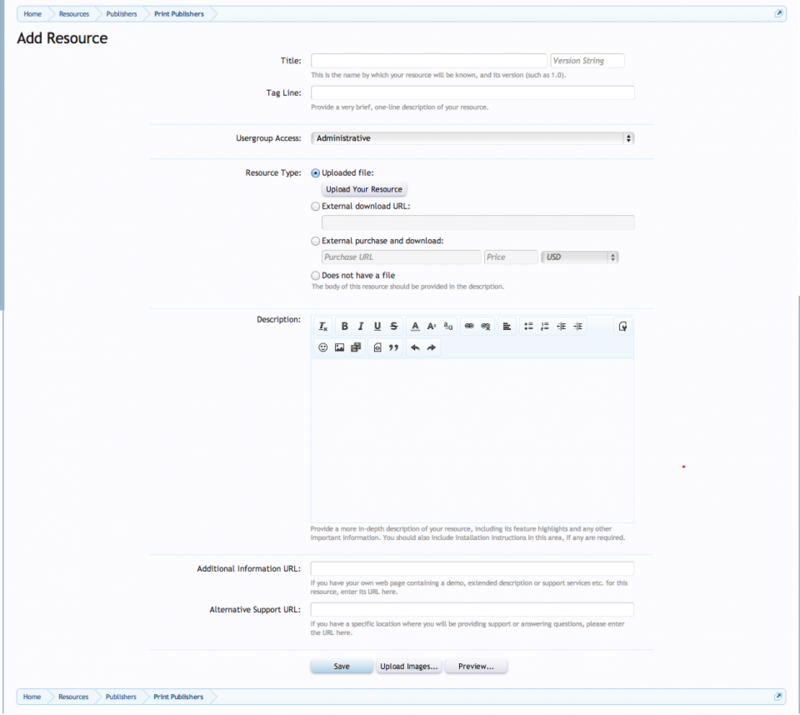 With our upgrade a few weeks ago we have new functionality that includes the Writing Resources section. I believe this section will develop into a valuable asset for our community. In this post I'll explain the section, a brief roadmap of where to go from here, current policies, and the need for community standards and moderation. What is the Writing Resource Section? The writing resource section is essentially a directory of writing-related resources, including both web-based, online, and downloadable writing resources. This can include things like Publishers, Writing Websites, Local Writing Groups, and much more. Though it's sparsely populated now, with time and community support it will grow into a valuable asset. In the resource section of WritingForums.org, you can submit resources related to just about anything writing-related. When you submit you can enter a description and link. You can also rate/review resources and leave a comment, which enables the whole community to see the reputation of particular resources (such as publishers or other service providers). You can also follow a resource, which enables you to get an alert each time that resource is updated. Though it's not currently enabled, in the coming weeks adding a resource will have a strong impact upon reputation. Among the potentially most valuable categories are the Publisher Directory, Agent Directory, and the Word Mechanics sections. Though each section can grow in time, there are two sections that I feel will be valuable right away. The Publisher Directory has the sub-categories of Print (traditional) Publishing, Self-Publishing, and ePublishing, and is meant to act as a directory of publishers. Each publisher can have a base entry with a description of the company and their reputation; members can also leave comments and reviews. Many of you have requested an area to discuss particular publishers, and now we have it; unique to the publishers section, when you submit a publisher resource a thread is automatically created in Publisher Talk sub-forum (open to alternative forum names, btw). You can only make a publisher thread in the publisher discussion forum by submitting a resource - this allows us to limit it to one discussion thread per publisher. Publisher Talk threads also come with the prefix they were posted under, based on the type of publisher. The Word Mechanics resource area is meant to act as an updating resource for common spelling, punctuation, and grammar issues that come up regularly. For example, I added a first entry of Who or Whom? which explains when to properly use who or whom. It's not the best explanation by any sense (hopefully others will improve upon it); however, when this question arises elsewhere on the forum, we can link to this resource. If we can keep these accurate and high quality, those asking such spelling/punctuation/grammar questions may even avoid asking in the first place once they know of this resource. Ideally they will be updated and edited by members of our community to make them the best they can be and as accurate as possible. For some people, submitted resources will be moderated. Once they're approved by the staff or other members, they'll be publicly visible. New Members and Regular Members can submit resources, but they will be moderated. Senior Members can view moderated resources, and approve them, as well as submit resources without moderation. Contributing Members can approve moderated resources, edit resources by others (encouraged, when done to improve a resource), and can reassign a resource to another member when the resource seems abandoned and not updated. Without your help approving and updating resources, the writing resource section won't develop quickly. I encourage everyone to take the time to submit a resource or two if you're interested. If you're a senior member, help moderate and approve them. If you're a Contributing Member, consider editing and improving existing resources. In addition to community participation, we need community standards for what types of resources will be allowed. We need to develop quality standards and guidelines. I'd like to open discussion on this. What resources should be allowed or disallowed? What resources should be publicly editable to be improved? How else can this section be improved? That's all I have for now. I'll update this post with more information and policies as they are developed. I hope this section does grow to be a true asset for our community. Questions, suggestions, ideas for improvement? Please share them! How Do You Add a Resource? Adding a resource is easy. First, go to the writing resource section with a resource in mind. Locate the "Add Resource" button in the top right. Once you click that button, you'll see an overlay that allows you to select your resource category. Try to select the most appropriate one. Once you've done this, you'll be redirected to a page that allows you to enter the resource information. This includes the title, a brief tag/summary, resource type (ignore the upload - select no file), resource description, alternative/support link, and tags. Try to be as specific and descriptive as possible. For the description, make it original and factual. After this, click save at the bottom. You've just submitted a writing resource. This is excellent news, Daniel. Thank you for taking the time to be as detailed as you have in your presentation, visual aids an all! What happened to the Resource area? Hey, it's back. I was trying to find the cause of a server error so had to temporarily disable it.